Old Testament - Today we begin the book of Lamentations! Lamentations is a short 5 chapter book. It's essentially a post-script to the book of Jeremiah, and was likely written by the prophet Jeremiah. It is a book that surveys and laments Jerusalem and the Temple after the destruction of both by the Babylonians in about 586 B.C. A wonderful commentary on the book of Lamentations by Donald Curtis titled “The Fall of Jerusalem” is at this link - surf about 2/3rds the way down this page to get a good chapter by chapter overview of Lamentations - and to dive into info on the acrostics, etc. 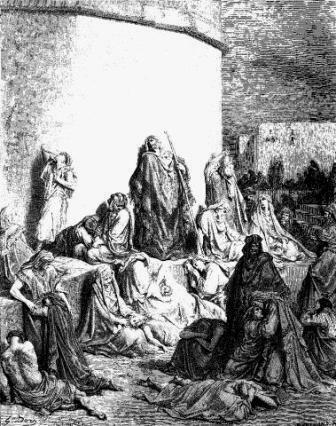 Content: The book of Lamentations is a funeral song, written for the fallen city of Jerusalem. 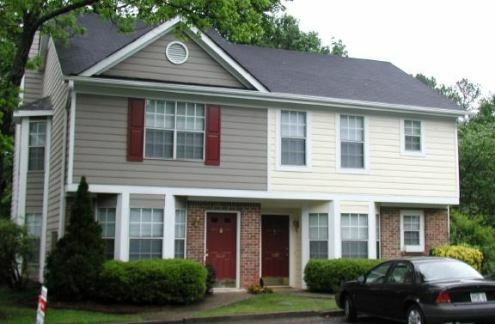 It was composed by Jeremiah, who was an eye-witness of all he describes in such vivid detail. 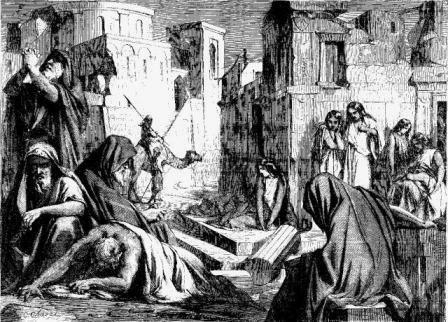 He shows the destruction in all its horror so that it could never again be asked, “Why did no one ever tell us the awful price we would have to pay for disobeying God?” There is very little of comfort, but Jeremiah’s prayer in chapter 5 does look beyond the desolate ashes of the once glorious Jerusalem to God whose throne endures forever. Only there can Jeremiah find any solace. Lamentations chapter 1 verse 1 sets the tone & stage for this book - "Jerusalem's streets, once bustling with people, are now silent. Like a widow broken with grief, she sits alone in her mourning. Once the queen of nations, she is now a slave." Why is this so? 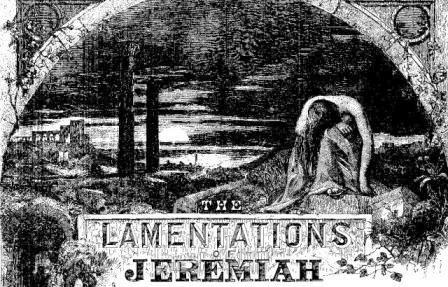 Well, we just read the book of the prophet Jeremiah, so we know why... One thing to keep in mind when reading Lamentations - it provides a glimpse at the devastating affects of unchecked & unrepentant sin. Per this verse above, do you think our sin change our position in life from being a "queen" to a "slave"? Today in Lamentations 1:14 we read: "My sins have been bound into a yoke; by his hands they were woven together. They have come upon my neck and the Lord has sapped my strength. He has handed me over to those I cannot withstand.” Do you believe that sin can become a “yoke” around your neck? Can sin sap your strength? 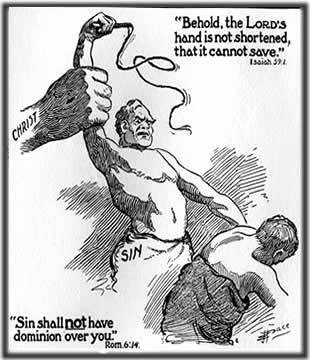 Can sin hand you over to those you cannot withstand? How can you be freed from this yoke of sin? Perhaps these words from Jesus in Matthew 11:28-30 will give us some ideas - “Come to me, all you who are weary and burdened, and I will give you rest. Take my yoke upon you and learn from me, for I am gentle and humble in heart, and you will find rest for your souls. 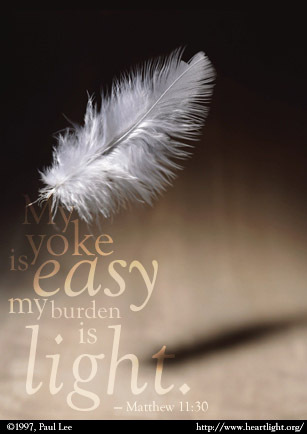 For my yoke is easy and my burden is light.” If there is a yoke of sin around your neck, will you allow Jesus to remove that yoke? Will you exchange the yoke of sin for the yoke of rest that Christ offers you today? Perhaps Lamentations chapter 2, verses 18 & 19, give us a hint at what we should do if we realize we've hit a rock bottom place in our lives due to unchecked sin - "Cry aloud before the Lord, O walls of Jerusalem! Let your tears flow like a river. Give yourselves no rest from weeping day or night. Rise during the night and cry out. Pour out your hearts like water to the Lord. Lift up your hands to him in prayer." If you are at that place of rock bottom, or nearing it, will you cry to the Lord? Will you pour out your heart to the Lord letting him know that you need him - that you cannot do life without him? Will you pray? New Testament - Today we read Paul's letter to Philemon! Content: A slave named Onesimus, who was owned by a Christian in Colosse named Philemon, had run away, ultimately making his way to Rome. Here he heard the gospel from Paul and became a believer. This letter was written by Paul to encourage Philemon to take Onesimus back, this time as more than a servant, indeed, as a Christian brother. There is a play on words in verse 11 where Paul says that now Onesimus (the word means “useful”) will in fact be Onesimus – useful both to Philemon and the ministry. Theme: This short book is quite important in many ways. Two things stand out. First, we see the way in which the gospel worked. No one is beyond the reach of God. If anyone will trust in Jesus, he will become a new person. Second, the ancient barriers of class hatred are being broken down by the gospel – Philemon and Onesimus are now Christian brothers. (Above commentary is from Tyndale Publishers “The One Year Bible Companion” pp. 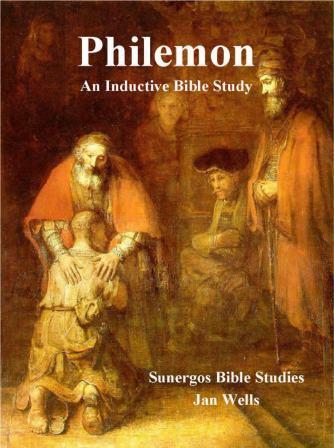 30-31) A great overview of the book of Philemon by Daniel B. Wallace is at this link. Verse 4 stands out to me in Philemon today - "I always thank God when I pray for you, Philemon..." How often do we tell our family or friends that we thank God for them? How often do we tell them that we pray for them? How often do we actually do both of these things? Proverbs - Proverbs 26:20 is another excellent reminder to not gossip - and when you stop, the gossip stops. Interesting how that works... "Fire goes out for lack of fuel, and quarrels disappear when gossip stops." Are you fueling any quarrels due to gossip these days? Will you stop being the fuel for that fire so that the fire can finally go out? Is God above all else in your life? Click here to meet the One above all! Prayer Point: Pray that you do not set your eyes upon any vile thing. Pray that deeds of faithless people will not cling to you. Pray that you will not follow the ways of faithless people in any way, shape or form. Pray that you will only follow Jesus. This is not the first reference in the Bible where “sin” and/or “sins” are seen as something that entraps and entangles because it has substance. I believe sin gives birth to its own rewards. It is not so much God punishing us for our sins but the consequences, the fruition of our acts catching up with us. In other books, sin is seen as producing cords that entangle us. Just as the Apostle Paul wrote about Fruit of the Spirit (Galatians 5:22) there is also a fruit of sin; just as there is an outgrowth from righteousness, there is also consequences of sin, a by-product. If we can visualize sin having cords that bind us and those around us then those same cords can be woven to make a yoke to not only enslave us but also to confine us in a straitjacket.